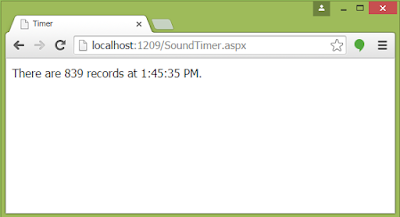 This tutorial show you how to set sound timer depend on the number of order. It plays sound for notification whenever the number of order change. Secondly, copy the following code to <form> tag. In code-behind, the following snippet should be there. It has the following code snippet in the DAL class. It uses the Microsoft.Practices.EnterpriseLibrary.Data.dll to shorten the code. This application demonstrates a simple use of the Timer control with UpdatePanel combining HTML5 audio element in a real world example. When displaying large amounts of data it's often best to only display a portion of the data, allowing the user to step through the data ten or so records at a time. While default paging was easy to implement, it carried with it a performance cost since all records to be paged through were being returned from the database.Custom paging solved this performance issue by requiring the page developer to tell the ListView exactly how many total records were being paged through as well as returning the precise subset of records to display on the page. The following example use ObjectDataSource for DAL and Microsoft.Practices.EnterpriseLibrary.Data.dll (download here) to shorten code. 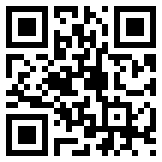 Copy the following code to <head> tag. Here is server controls and copy to <form> tag. 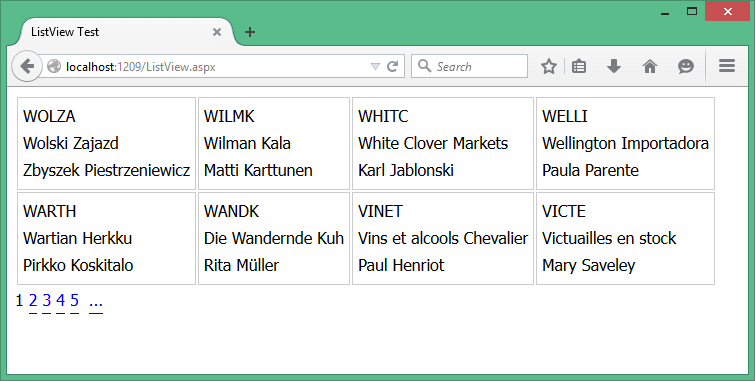 <asp:ListView ID="ListView1" runat="server" GroupItemCount="4" GroupPlaceholderID="groupPlaceHolder1"
Here is the connection string in web.config and it use sample "Northwind" db (download here) and "Customers" table. Here is the underlying DAL class for ObjectDataSource. Here is transact-sql (store procedure). That's it. Happy Myanmar New Year!! !